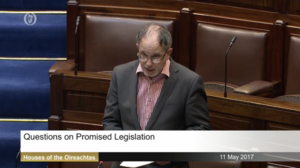 During Questions on Promised Legislation. 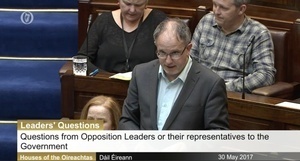 Sinn Féin deputy leader Mary Lou McDonald spoke about the late Dara Quigley and her question was responded to by Minister for Justice Frances Fitzgerald. 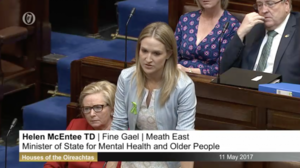 Mick Barry, of the Solidarity-People Before Profit party, also spoke about Dara and Fine Gael’s Minister of State for Mental Health Helen McEntee responded to him. 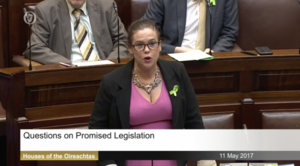 Mary Lou McDonald: “Tánaiste, yesterday, the Taoiseach indicated that you would be more than happy, in fact delighted, it seemed, to come before the House and make a statement on the matters surrounding Templemore and some of the issues that we touched on and Leaders’ Questions. You also indicated that you would be quite happy to take questions in that regard. So I want to know, when you propose to do that. 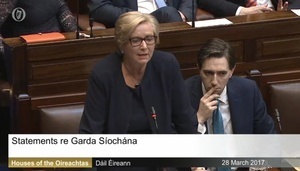 Posted in Misc and tagged An Garda Síochána, Dail, Dara Quigley, dual diagnosis, Frances Fitzgerald, Mary Lou McDonald, Mick Barry at 4:05 pm on May 11, 2017 by Broadsheet. I hope the dual diagnosis programme referred to in the last paragraph is devised and implemented quickly, and that it works. Isn’t it about time we listened to people like myself who made it through these difficult times. I don’t have a patent on mental health.I would like the chance to apply my experience through a framework initiated by mental health professionals is all I require.Trust me it’s been made ridiculously hard to tell my story. I never thought telling the truth in order to help others could be made so difficult. From anyone’s perspective I am a very successful mental health exponent statically speaking . Yet the government and other organisations would much rather bring in no change. The same voices who bring awareness are unable to bring change however well meaning they are. If altruism was alive and well with mental health in Ireland today things would be so much further along the line. Instead what we have is a race to the bottom. Everyone for themselves. It’s depressing in its own right unfortunately. Thanks yes I am haven’t been hospitalised in nearly 20 days, no big suicidal ideation in 3 years, after having it all my adult life since i was 15, looking into my childhood really helped me, my older sister Siobhan died in a cot death and Mam had breast cancer during that pregnancy, long long story which i only really found out 3 years ago. Appreciate you asking, If Ireland was like Darkness into Light every day it would be great, but its not even close. I work in city centre as an IT consultant. Trust me its still quite dark out there, relatively better i guess, but the awareness of education of people in general towards mental health is very poor. There’s no people like him… it’s a spectrum that everyone’s on. There’s no normal, really. Thanks for sharing Bill. I’m sorry you had to go through such an ordeal. Was your depression defined? You’re an obnoxious effer and it’s a serious effort be on your side. Let them form a line that I think looks straight. Give the indignated space for their indignation. It’s rule 22 of the internet. Rule 1 is anyone can make up a rulre but number 23 is taken. Misspellings get you bonus points, and there are NO RULES. (EXCEPT GRAMMAR AND PROPER,..PUnction and stuff. Keep your posts short if yoou want to popular without…I dunno… I dont wash my underwear… I sell them, but that’s a different level of reality you wouldn’t understand if you have a television. I hate to say it but I fully(ish) agree with you on this issue. Thanks Johnny, I and other psychologists believe my bipolar I diagnosis at 22 was wrong. Currently I have reduced lithium by 50% in the past 18 months. I don’t believe its possible to be this open without really going through the other side. I work as an IT consultant in city centre. Just read the 2 links Bill. You seem to have went through a tough time. Well done on working hard to get to where you are today. Misdiagnosis seems to be all to prevalent. I can only presume how tough that was and then dealing with a new diagnosis. Alternative solutions like reiki don’t seem to on the radar for most people. The conventional GP will not lead patients to alternative mechanisms to dealing with mental illness. There isn’t much money in that. I think your story sheds a light for good and it’s important to appreciate that everyone’s depression is different, but is real to them. Thanks for sharing Bill. Stay cool fella. Nobody should be shamed, fired, or harassed for this. They should be educated in the right thing to do. Like Sinn Féin give a sh1t about life. Ah give it a rest, Mourning. Not the time or the place for cheap shots against the hated “Shinners”. [WHY am I on the same side as the people I usually disagree with the first, the fastest and the most often? THIS IS WRECKING ME HEAD. I never knew that hive-mentality was a REAL thing until yesterday. Heigh-ho, let’s go, do it again tomorrow. You people talk to mirrors. Mind your own business, you boring bollix. nothing will happen with the garda who shared the footage. he/she will probably be promoted. 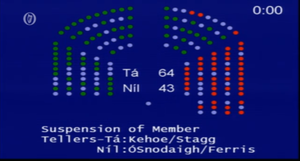 I know of two gardai who were promoted after a legal action against the state which cost at least €200k. one is a sergeant now one is a detective. Good for them. Who cares? Oh you’re such a troll. Yeah. You know me so well. They sent me a poster of you. Can I get my 50p back? That photo of Mary Lou is awesome. If Russ Meyer was still alive, I’d want him to cast her. Who ate all the pies? Mary did. 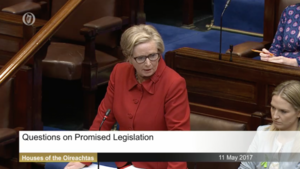 The level of casual abuse directed against female politicians, more often than not in relation to their personal appearance, is actually stomach-churning. (and I say this as someone who hates SF, with a strong dislike for Mary Lou). I am equal in my abuse, I don’t discriminate. I call out overweight men as well. Obesity is a massive problem in this country, possibly the biggest threat to our health service.